Global insurance company AIA and local Singapore university NTU have joined hands to establish an Edge Lab to develop innovative healthcare and insurance solutions. Edge Lab brings together start-ups, government agencies, university experts and private sector collaborators to drive innovation in the life insurance sector. It will identify new ways of addressing evolving healthcare challenges. The investment from NTU and AIA is currently equal in terms of monetary support as well as human capital. The new lab will be co-led by NTUitive director (Information & Communications Technology) Viktor Cheng and AIA director (Group Innovation) Prashant Argawal. Going forward, a key focus of the lab will be to find ways to make insurance more accessible and to better manage issues around rising healthcare costs. It will look to improve patient outcomes by leveraging technology, big data and analytics. The lab’s consumer-centric solutions will be shared with AIA teams across Asia Pacific. The Edge Lab will also tap NTU’s research capabilities such as in data security and advance analytics to further strengthen Singapore’s quest to be a leading health and financial technology hub across Asia. Speaking at the launch at Singapore’s start-up hub NTUitive@79, Minister of State for Manpower Teo Ser Luck said the Edge Lab plays a role in helping to strengthen Singapore’s foundation to sustain healthy economic growth. 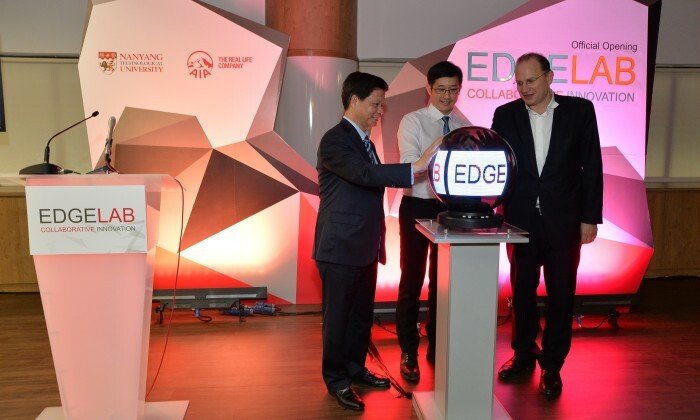 “The launch of EDGE LAB also demonstrates the strong culture of open innovation in Singapore. Such a culture helps to bridge the gaps between research and industry by making the research and skillsets of our workforce more relevant to the business world,” Teo added. He added the collaboration between NTU and AIA will boost Singapore’s ambitions to be a leading health and fintech – or finance technology – hub across Asia. “At the same time, it will create quality and diverse job opportunities for our people, help transform traditional businesses with innovation thinking, and play a part in building up capability for future workforce,” said Teo. AIA is no stranger to digital health. The launch of the EDGE LAB follows a recent kick off of the AIA Accelerator programme in Hong Kong in 2014. Speaking to Marketing, chief operations officer Simeon Preston who also sits in the the Group-wide executive committee of AIA said Singapore is currently ranked seventh in the world and first in the Asia Pacific in the Global Innovation Index 2015, which was announced in September. Moreover, the global digital health market is also expected to grow at a Compound Annual Growth Rate (CAGR) of 16.87% over the period 2014-2019 and is expected to reach US$233.3 billion by 2020 as consumers demand more accessibility and transparency in healthcare. Hence it is vital that companies such as AIA bring the two worlds closer together to stay ahead of the game. While innovation hubs and centres seem to be a top priority for many companies today, what sets AIA’s new lab apart is the combination of “two terrific brands (AIA and NTU) with a history of innovation, commercial and academic success – and it is practical, built and of course running,” Preston, said. Moreover, this lab is purely focused on APAC markets. “At AIA we prefer to announce our plans after it is built rather than before. We know the areas we need to improve and it is best to rapidly do that. In the past we have tried to build the capabilities in house and solve problems ourselves. But what we have realised is that in the modern world of tech, you do not need solve all problems youself. You can partner with the best of breed across the region and use their expertise to help you,” Preston explained. While he was not able to share with Marketing the exact monetary investments or the benchmark of success the lab has set internally, he explained for AIA, the lab is a way to push focus on adopting new learning skills. The lab will also help the company understand what is happening beyond the healthcare industry that can be integrated into AIA’s practices. While acquiring new customers is always on AIA’s radar, the new lab will also look to specifically come up with solutions that will attract the younger generations for whom insurance is often seen as an old-fashioned, paper-based industry. “What we are doing is providing a social and economic safety net for the younger generation by coming across more alive and innovative,” he added. Preston explains innovation to him is about solving the problems while figuring out new areas and experimenting in them. However the word has only recently taken off because of the proliferation of tech across every vertical of life. But innovation is not just another way of saying brain storming or creativity. True innovation, according to Preston, lies in execution. “You can think all you want but without execution, you will fall behind and not innovate,” Preston added. If you have S + EX – you tend to be conservative and you do things better and better but miss out leapfrogging or taking on certain great opportunities. If you have E + I – you spend a lot of money without direction with a lot of investments in different places and no coherence in. “The three need to come together for any successful innovation. At AIA we put a significant amount of our budget aside for innovation and have a dedicated innovation team. But ultimately, innovation, big or small, should be everyone’s duty in a company,” Preston added.